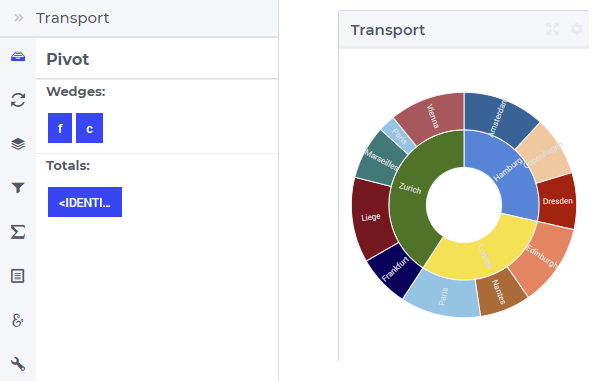 More generally, a pie chart widget offers the possibility to display multi-dimensional data in your model by displaying a wedge for each data point. The surface of a wedge provides information about the value of the corresponding data point. 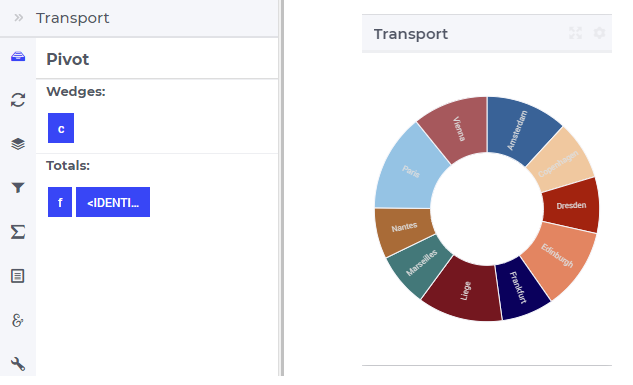 For example, in the TransNet application, the transport amounts for every combination (factory, center) may be represented using a pie chart widget like illustrated in more details in the sequel. 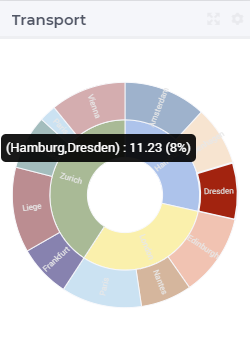 More specifically, we discuss and illustrate below one-by-one the tabs in the pie chart’s options editor. 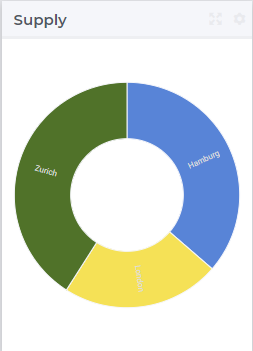 So, now for every center c there is one wedge in the chart representing the total transport to this center from all factories. 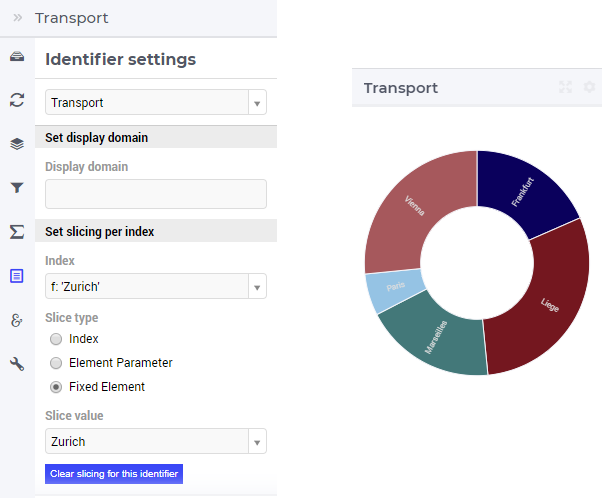 In the Identifier Settings tab of the widget’s options editor, one can apply a display domain or some slicing to the data identifier(s). 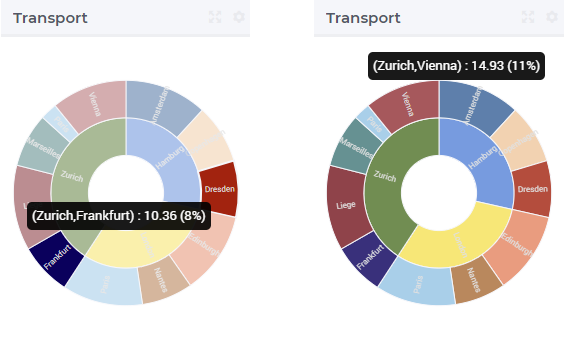 The “Set display domain” section works in the same way as for e.g.. the bar chart. Similarly, one could slice the index f to an element parameter CurrentFactory having the declared range the set Factories (where the value of CurrentFactory may be determined from within the model or by a choice made through another widget in the user interface). 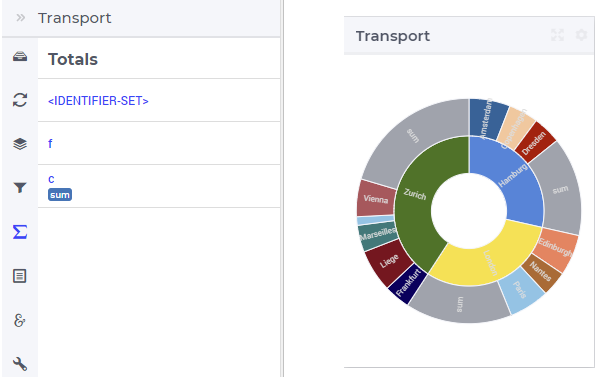 In the Miscellaneous tab of the pie chart’s options editor, other options may be set such as the title of the widget, whether or not the widget is visible (this may be determined by a model parameter) or the number of decimals for the values displayed in the chart.